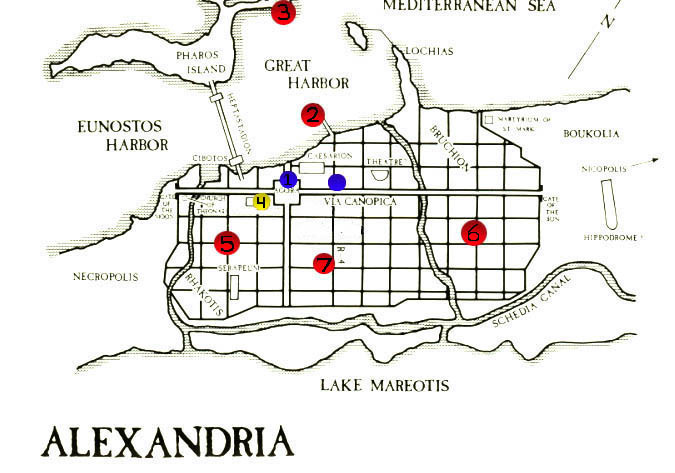 Welcome to Alexandria, one of two major cities competing for dominance in the ancient world as both a capitol city and the center for the teachings of Christianity. Below is a map of the city. The large red dots connect to major points of interest within the city, as well as general areas for the various religions within the city. The blue dots are more personal sites within the city, and various places for city life. The golden dot is the Library of Alexandria, the source of knowledge from the ancient world. Feel free to click on any dot to guide you through this illustrious city.